I live in Florida where sand is my nemesis. It is literally EVERYWHERE! 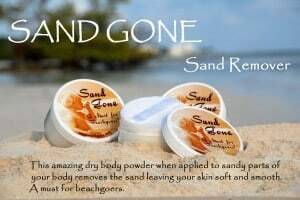 To the rescue is Sand Gone which is a dry body powder that vanquishes the sand from your body. It is very easy to apply and most importantly it is safe and non-toxic so there is no need to worry about harmful ingredients. I won’t use a lot of powder type products because it irritates Hannah’s asthma but Sand Gone didn’t cause any issues and I have used it a lot. I loved the delicate scent of coconut which was not overpowering. Where do I use Sand Gone? Of course it is a staple in my beach bag but I also use it when the kids go to the park, play in a sand box, outdoors and even at my church playground which inexplicably was created entirely on top of sand. It used to drive me insane when I would clean my car and house and then in no time at all it would be sandy and gritty feeling…yuck! Sand Gone made our skin feel soft and there was not irritation or scratchy feeling at all. My kids have super sensitive skin and there was no reaction to Sand Gone. Purchase Sand Gonefor only $12.95.